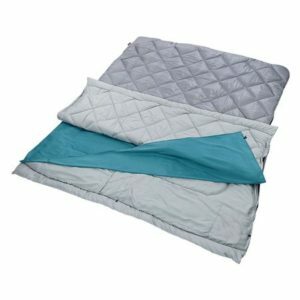 The Best Double Sleeping Bags – Top 5 Reviewed – Camping is something almost all of us do at least once in our lifetime. It could be out in the back garden with the kids, on a regular campsite or even totally cut off out in the wilderness. No matter where you find yourself you will always require a good sleeping bag. If camping with your partner what better way to snuggle up in a cold evening than sharing a double sleeping bag. Practicalities aside its much more romantic having a cuddle enduring a cold night a tent. When it comes to choosing the right double sleeping bag there are so many options on the market that it can get very confusing due to the massive price differences and each brand quoting so many benefits that it can be very hard to make your mind up. This article is designed to help you choose the best double sleeping bag. We have whittled down and personally tested the 5 listed below. In our opinion, these are the top 5 best double sleeping bags on the market today for price and quality. 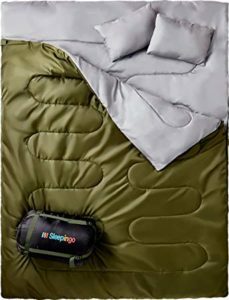 The double sleeping bag from Sleepingo is the king of double sleeping bags. It is one of the more popular double sleeping bags for camping as it compresses down to a very compact size. This double sleeping bag is awesome for very cold weather and has a temperature rating of -32 degrees. Furthermore, the sleeping bag is waterproof and a good option for wet weather conditions. It is equally good for teens and adults and you can use it in your tent, truck or as a sleeping pad as well. The dimensions of this double sleeping bag are 87-inch x 59-inch. The best part is it also comes with a couple of sleeping pillows. The external side of the sleeping bag is tough and can handle the rigors of outdoors while on the inside it is extremely comfortable. However, the downside of this product is that it is not an ideal option for warm or normal climate conditions. Its most definitely designed for winter use. 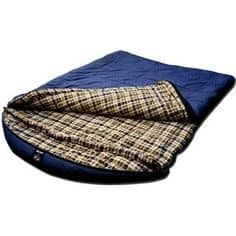 There are two zippers in the middle at the bottom which means each person can have his/her own sleeping space as needed. Another downside of this sleeping bag is the pillows that come with it. These pillows are slightly below par when we talk about quality and comfort. It is made of good quality nylon and is resistant to water. You can separate the sleeping space with help of a zipper. zippers can undo on their own. The pillows are of low-quality. It is a good option for those who want a good quality sleeping bag for two that can stand the test of time and is good for colder climates. Also very reasonably priced. The King Cove from WildHorn Outfitters is the best 2 person sleeping bag if you are looking for value for money. 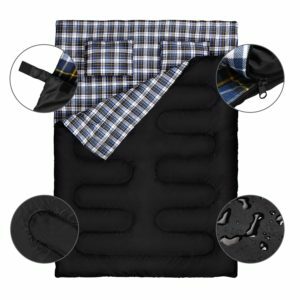 The California king size sleeping bag has dimensions of 86-inch x 72-inch and it features a removable interior liner that you can wash in your machine. Furthermore, you can make double to single conversion with this giant sleeping bag too. The size of the single bag will be equal to a twin sized bed. If you and your partner enjoy open sleeping space then you are both going to love it. The Softex liners are a highly breathable plus, they wick moisture too. It means they will not develop any smells over time. Having the ability to remove the interior liner is a massive benefit in our eyes. Being able to machine wash it means no germs or bacteria to worry about and always having a fresh smelling sleeping bag on each camping trip is a massive plus! The temperature rating of this sleeping bag for two is 30 degrees which is more than enough in most winter camping situations. The sleeping bag is made of nylon ripstop and it stays durable for a long lasting period. However, one of the shortcomings of this sleeping bag for two is that it’s not an ideal option for hiking due to its massive size. It is an excellent option for camping but not for hiking. King Cove is one of the best options for camping purposes. You can convert the double into a single sleeping bag with ease. The giant California king sleeping bag can turn into two twin sized bags using the top quality zippers. It is extremely comfortable in cold weather (30 degrees). It wicks moisture and insulates heat. You can detach the Softex liners for easy machine cleaning. It is very bulky and not an ideal choice for hiking purposes. It is a good option for extremely cold climates and not an all season sleeping bag. If you are looking to camp in cold and chilly regions and want a spacious and comfortable sleeping bag then look no further, the King Cove has you well and truly covered. This stylish looking double sleeping bag from Canway is a great option if you are a little tight on budget. Nevertheless, low on price doesn’t mean that this Canway sleeping bag for two slips away on quality. The queen sized bag comes with dimensions of 85-inch x 57-inch and weighs six and a half pounds which is ok for carrying over short to medium distances. This double sleeping bag is resistant to water and is made of 210T polyester. It also features flannel liner with fillings of cotton which will keep you warm and cozy even in cold or wet weather. However, it’s not designed for extremely cold or freezing conditions. 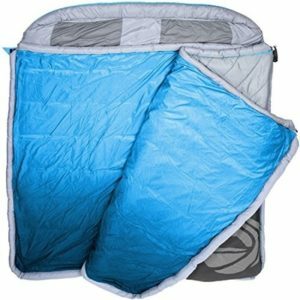 The sleeping bag is very easy to clean in your machine and despite the huge size, you can compress it down to a compact size for easy carrying. You can also detach and convert your double sleeping bag into two separate bags with the help of double sided zippers on both sides of the bag. The individual parts will contain a zipper on one side. The premium quality sleeping bag comes with two pillows. This lightweight bag is a good option for hiking and camping. It is waterproof and has a temperature rating of 42-degrees. The sleeping bag from Canway is not designed for freezing temperatures. It can leak cold air where the zippers come together. big performance, and a great choice! If you want to choose from different color options and love to hike then you need the Grizzly from Black Pine. It comes in five different colors and has a temperature rating of -25 degrees. This means that the Grizzly sleeping bag is an ideal choice for extremely cold climates and freezing temperatures. If you want a very warm sleeping bag that you can use in subzero temperatures then look no further. Black Pine has used polyester in its construction and is very spacious for a couple. It also features dual-layered offset design to provide you with a very cozy feel even in temperatures below zero. The Grizzly is best for very cold environments only and is not an all-season sleeping bag. This double sleeping bag does not compress down to a very compact size making carrying it to your campsite that bit more awkward. The Grizzly is the best choice for extremely cold environments. It comes with moisture wicking and waterproof capabilities. The sleeping bag is extremely cozy and comfortable on the inside. The exterior is made of 100% polyester and offers excellent durability. It is not a good all-season option. The sleeping bag weighs more than the others and does not compress down as small making it awkward to carry over distance. A great winter double sleeping bag, very comfortable and warm but a bit heavy and awkward to carry. The Tandem by Coleman is perfect for taller people. You can zip apart the double sleeping bag if you want to maintain some sleeping space. It comfortably fits people with a height of up to 6 feet 4 inches. It features ColeTherm polyester insulation that provides you with warmth in cold climates. In addition, its ZipPlow feature keeps the fabric away during zipping and prevents snagging. Furthermore, the Tandem’s Roll Control construction coupled with Quick Cord feature makes it easy for you to roll, tote and fasten the bag securely. You can convert the Tandem from double to two single bags with good quality zippers. It can accommodate tall people with a height of up to 6 feet four inches. It features Quick Cord and Roll Control construction to conveniently roll, tote and fasten. It is more of an all season sleeping bag rather than designed for just cold climates. Its liners and zippers are flimsy. The Tandem by Coleman is a good budget-friendly option that you can use all year round and is great for carrying on your back while hiking to your campsite and back. What to consider before buying the best 2 person sleeping bag? The materials of a double sleeping bag have a huge role to play in durability and the most durable of them all is polyester and nylon ripstop. These materials have stood the test of time and prove to be the best option when it comes to outdoor purposes. These materials make your sleeping bag for two resistant to abrasion. The zippers should also be high quality. You need to consider the exact dimensions of the double sleeping bag you are considering. Some brands emphasize the individual size of each person while others design according to the overall size. Therefore, you have to get the dimensions right if you are to enjoy a comfortable sleep experience while camping or hiking with your partner. You should consider weight if you know that you are going to hike different trails. If you are planning to just drive your way to a campsite then having a few extra pounds won’t matter. However, if you have to hike for some distance then carrying huge weights on your back doesn’t make sense. Hence, the compressed weight of your double sleeping bag needs to be a manageable weight for you. Most of the double sleeping bags weigh around 5 lbs to 9 lbs so the difference can be a lot, choose the correct weight wisely. If you are hiking and going to be carrying your double sleeping bag for long periods at a time then choosing a sleeping bag which compresses down is a very important factor to consider. Comfort is important because you will share your sleeping bag with your partner and sleeping preferences tend to differ from person to person. You need to know how cramped is comfortable enough for you. It is important to try out different bags and go through the specifications about different sizes of double sleeping bags. 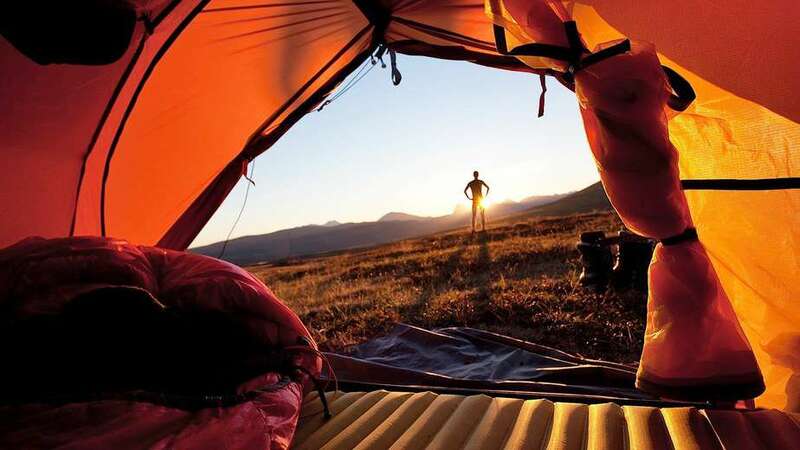 You need to extract the maximum value out of your sleeping bag and for this reason, you have to focus on the quality of the materials used in the construction of the product you are considering to buy. Your double sleeping bag needs to take plenty of beating and it has to be rugged without compromising comfort. A sleeping bag for two must be waterproof because you just never know for sure what the weather is going to be. Trusting the weather report is a campers worst mistake. You don’t want a nasty surprise when your double sleeping bag starts soaking water and moisture all the way through to the inside. Another crucial feature to look at is temperature rating. If you are going to a region with a cold or climate then you must consider this rating. Furthermore, you must also notice the temperature in that region during a specific time of the year. It’s about feeling comfortable with your partner inside the bag. You don’t want to feel too hot or too cold. For example, a 30-degree sleeping bag is best for the climate with a 30-degree temperature but will only be effective if you are dressed in the proper attire suitable to that climate. Our personal favorite of this roundup of the best two person sleeping bag is the Sleepingo. Sleepingo’s double sleeping bag not only comes at a good price but has plenty of features to offer. Your purchase will include two pillows for travel and the bag itself is covered under a lifetime warranty. It only weighs 3 lbs so you can conveniently compress and carry it on your back while hiking. It comes with a temperature rating of 32-degree which means that it will serve you well in cold climates. We do hope you have found this post very informative. If you have any suggestions or queries for us then you can drop your comment below in the section given. PrevPreviousThe Best Double Camping Cot – Top 5 Reviewed!